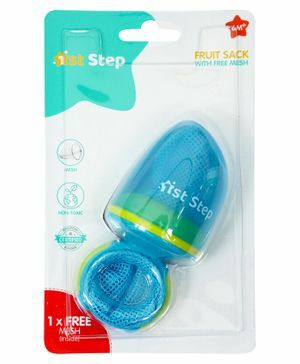 1st Step Fresh Food Feeder provides a handy solution for feeding fruits and vegetables to your child. This Fresh Food Feeder is a perfect way to allow your baby enjoy a range of delicious foods without the risk of choking. Perfect for home or travel, the feeder is a great way to give your baby whole, fresh, age appropriate foods. The convenient storage cap help keep foods fresh while travelling with baby. "i want to return my product"
"its good but depends on baby"
Nice product to make kid habitual for self eating. Good product for feeding fruits to the chile. However, the child will drip juices on his / her cloths in case of juicy fruits. But at least the child will have a feeling of self feeding. it becomes too messy as sack is too big for babys mouth n they tend to hold d sack instead of handle. waste of money..its not in apt size as for kids and creates so mess . "Good produce for the price"
As we are introducing solid food for our baby, ordered this to avoid any chocking hazard. The quality is very good and has space to fill small slices of food. It has a wider area for grip.